Figure 1. Thermocouples are used to measure temperature. When a temperature difference exists between the junctions of two dissimilar electrical conductors, a potential difference is created. This causes a current to flow round the circuit. A meter is included to indicate the current (flow of electrons) and it may be calibrated to read in a convenient temperature scale. Figure 2. 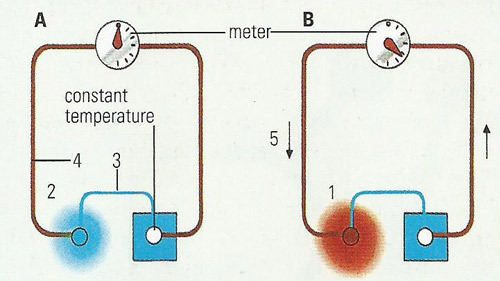 In a thermocouple (left) a temperature difference between he two junctions of a circuit, made of two dissimilar metals, will produce a current, indicated by a meter., which is proportional to the temperature difference. In a thermopile (right), several thermocouples are connected in series to increase the voltage of the circuit. A thermocouple is a device for measuring temperature that uses two wires of unlike metals, such as platinum and bismuth, or semiconducting rods, which are welded together at their ends to form a junction (see Figure 1). The principle behind the thermocouple is known as the Seebeck effect. When a conductor is placed in a temperature gradient, electrons diffuse along the gradient and an electromotive force (emf) is generated. The magnitude of the emf depends on the material and its physical condition. To measure the generated thermal emf, the circuit must be completed using a second different conductor. This is joined to the first conductor at the point of measurement and passes through the same temperature gradient. The thermocouple emf is then the difference between the emfs generated in the two conductors. where E is the net emf generated and Sa and Sb are the Seebeck coefficients of conductors a and b. Many different thermocouple combinations have been used, but only eight are standardized in IEC 584-1. These include three noble metal thermocouples using platinum and platinum-rhodium alloys, widely used for temperature measurement up to 1600°C. The remaining five mainly use nickel-based alloys (see constantan), which are cheaper and more suitable for industrial use up to about 1200°C. Other refractory alloys can be used up to and beyond 2000°C. The simplicity, ruggedness, low cost, small size and wide temperature range of thermocouples make them the most common type of temperature sensor in industrial use. A thermopile is a device used to measure radiant heat, consisting of several thermocouples connected together in series (see Figure 2). Alternate junctions are blackened for absorbing radiant heat, the other junctions are shielded from radiation. The electromotive force generated by the temperature difference between the junctions can be measured. From this the temperature of the blackened junctions can be calculated, and thus the intensity of the radiation measured.